When considering the weight of the bullets recovered during the survey at house No.17 it was noted that there was diverse range. The maximum weight recorded was 11.4g with 10 bullets (12%) weighing in at over 11g and 8 bullets (9.4%) between 10 and 11g. The minimum weight of a complete bullet was 3.2g. There was however a spread of weights in between these two extremes. 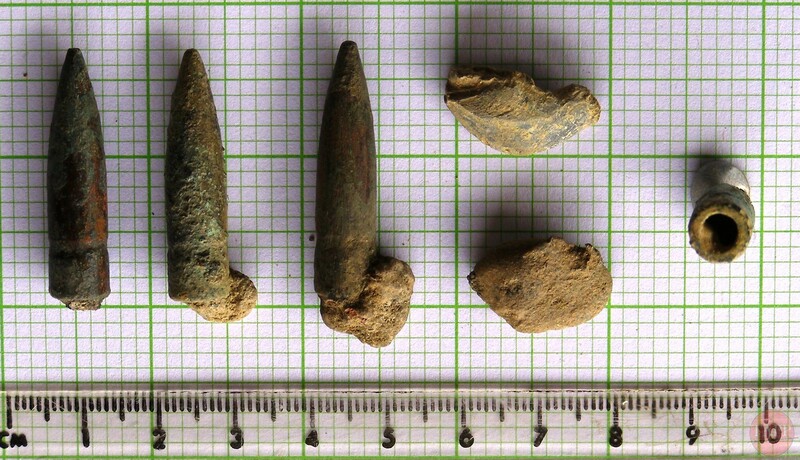 This inferred that there was an ongoing deterioration in the weight of the bullet rather than a distinct change in typology. A number of theories were put forward for this phenomena however the most likely cause is that the bullet was subject to intense heat. A standard Mk VII .303 round used a 174grain (11.3g) Spitzer (pointed) bullet which provided a muzzle velocity of 2,440 ft / sec. Unlike other full metal jacket8 rounds the front third of the Mk VII was made out of aluminum (from Canada) or tenite (cellulosic plastic), wood pulp9 or compressed paper, instead of lead. This made the bullet tail heavy and made it tumble on impact thereby inflicting considerably more damage than the standard round. In spite of this the round was legal according to the terms of the Hague Convention. These bullets were found in a areas where equipment had been left after the fighting or in locations known to have been associated with destruction caused by fire. This suggests that there was a concerted effort to destroy the ammunition sometime after the fighting or they rounds were caught in the the house No.17 when it was set alight at the end of the fighting in the evening of the 15th February. Bullets found at No.8 Adam Park with similar characteristics were also found in a deposit of black soot which suggests the bullets were burnt onsite.